Port Elizabeth - Sustained pressure by South Africa’s bowling attack was the key to their 2-0 series whitewash over New Zealand, Proteas skipper Graeme Smith said here on Monday. “When things are going well and bowlers are bowling quick, it’s great but the difference now is that our attack is relentless and the bowlers can back each other up,” said Smith after his team beat the Black Caps by an innings and 193 runs before lunch on day four of the second Test. “Having guys that keep coming at you all day - creating pressure and bowling with pace and intensity - is crucial to our success,” he said. The last time South Africa won two consecutive Tests in a home series was in November 2008 against Bangladesh, and they went on to repeat the feat a month later against Australia away. South Africa batted first at St George’s Park and posted a total of 525 for eight, declared. They then forced the Black Caps to follow-on after the visitors had been bowled out for 121 in their first innings. “Once you create that intensity and pressure it rubs off and has a snowball effect,” Smith said. “We’ve been really professional in all aspects - bar one or two catches which we put down in Cape Town - but we’ve played a very high standard of Test cricket. Dean Brownlie and BJ Watling were the only two batsmen to make runs for the Black Caps in their second innings. However, once they departed, New Zealand capitulated to 211 all out. With one century behind his name, Watling went on to score his second 63 of the match, and his third half-century in his ten-match Test career. Brownlie (53) was equally tenacious and showed his century in Cape Town was no fluke. However, two runs short of the pair’s hundred partnership, Brownlie got a faint edge to Jacques Kallis. His wicket opened the door to the tail and it was only a matter of time before Dale Steyn and Morne Morkel cleaned up the tail with the new ball. Smith said there was an obvious gap in the standards between the two teams and while the Kiwi bowlers had shown some potential, they needed a more solid batting unit to be successful in world cricket. “If you play two Tests and win both of them by an innings, it’s fair to say we outplayed them comprehensively,” he said. 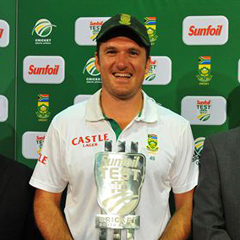 Following his five-wicket haul in the first innings Steyn bagged 3/48 and Morkel finished with 2/36. Rory Kleinveldt and Robin Peterson picked up two apiece and Jacques Kallis one. “If a batter gives Dale a sniff, he has that killer instinct and is able to step up and make it count,” Smith said of Steyn, who was named man-of-the-match. “It’s great for us to have that in our environment and he sets the tone for all of us to follow. The Proteas now set their sights on a three-match ODI series against the Kiwis, which starts in Paarl on Saturday.